For the new record, “we tried to capture the dynamics of our live shows.” As well the band up until now, has been doing everything 100% themselves -- and for this record they are working with TopSpin, as well as indie distribution and marketing. “It’s like getting to the top of a mountain and finding a 300-foot wall, you gotta throw a rope over to help you get to the other side,” says Fluitt. 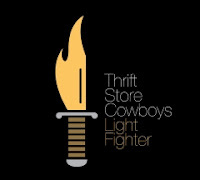 Thrift Store Cowboys kick off a month-long tour on West Coast in September, and will be on the road all year in support of Light Fighter. I know you’ll enjoy the novel. I wrote the story that embodied the Native Americans, Outlaws and African-American/Black soldiers, from the south to the north, in the days of the Native American Wars with the approaching United States of America. This story is about, brutality, compassion, reprisal, bravery, heroism and gallantry. The story shows the truism to the fullest of a PG-14 perspective...with a DVD release to show the fullest reality of war. Read the novel, Rescue at Pine Ridge, the story of the rescue of the famed 7th Cavalry by the 9th Cavalry Buffalo Soldiers.